them to match the wrapping paper or the season. 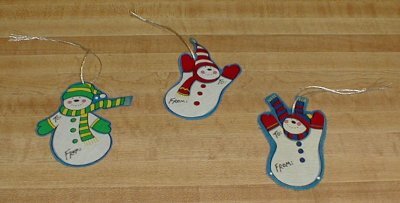 These cute little tags can also be used as Christmas tree ornaments. Fabric with small ornament prints that can be cut out and are sized for a gift tag. Another fabric that matches the theme for the backing of your gift tag. 2. Insert the webbing in-between the two inner sides of the material. absolutely sure the iron does not get damaged, place a napkin under and over the gift tag to protect the iron. 5. Press the gift tag with the iron until the webbing is glued and attached to both sides of the material. 6. Let the gift tag cool for a few minutes. 7. Once the gift tag is cooled, cut the ornament out leaving approximately 1/8th of an inch exposed. 8. Tie off the ornament with cross stitch floss. 9. Using a colored thin marker, print the words “to” and “from” on the gift tag.